When United Nations official Kevin M. Kennedy, the Regional Humanitarian Coordinator for the Crisis in Syria, visited Msgr. Bonner and Archbishop Prendergast High School in Drexel Hill on March 29 to address the student body, he was on familiar turf. He graduated from Msgr. Bonner in 1965, the same year his wife Kathleen graduated from then-adjoining Archbishop Prendergast High School for Girls. But they didn’t meet each other until they both attended West Chester College, which is not surprising, considering the combined graduating classes for the two sister high schools was about 1,800. 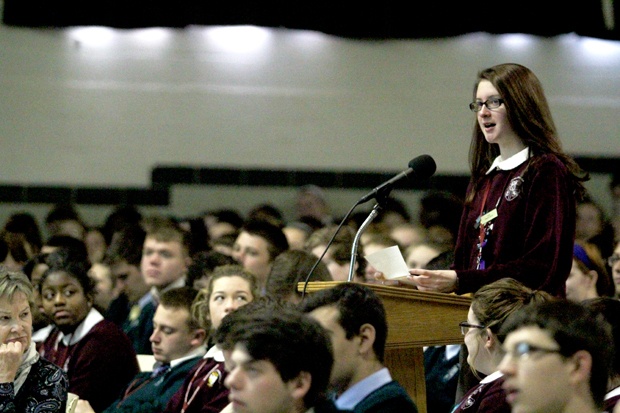 Kennedy is also a member of the Msgr. Bonner Hall of Fame, inducted in 2005. After a distinguished career of 25 years as an officer in the United States Marines, including command of the 2nd Battalion 5th Marines for the liberation of Kuwait during the first Gulf War, he retired with the rank of colonel. He joined the United Nations staff in 1993, concentrating on humanitarian emergencies around the globe. This has taken him to Africa, Asia the South Pacific and the Middle East. His humanitarian work can be just as dangerous as active military service. In 2003, when a car bomb destroyed the U.N. headquarters in Baghdad killing about two dozen people, including the U.N. envoy, he immediately flew there and successfully organized the recovery work. 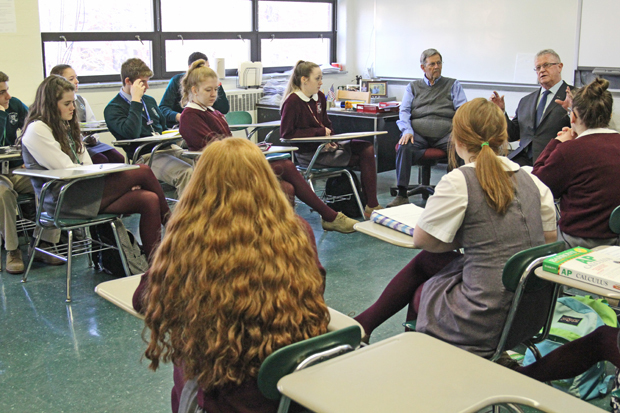 Kennedy, who spoke and took questions from an assembly of all the Bonner-Prendie students this week, also spoke at two Advanced Placement Government classes taught by Charlie Wieners. Working with the U.N. has been easier from a family standpoint because when he was in the Marines he and Kathleen were raising four children and “we had to move 17 times,” Kennedy said. He noted similarities between the work done by the military and that of the U.N. “They are both non-profit working in the public sector,” he said, adding the Marines are more structured and the U.N. somewhat more flexible. His has an international staff and often he is the only American in the room, although his co-workers are intelligent and dedicated. Most, including himself, are fluent in several languages but as a practical matter English is generally understood by all. He does find in other countries and especially in Europe that people tend to be more informed on foreign affairs than in the U.S.
“What happens overseas, such as just happened in Brussels, has a direct impact on the safety and security of the United States,” he said. Right now in his sector there is the very difficult task of trying to broker a peace agreement between the various factions in Syria, leading to a new government. A challenge is that the various parties not only disagree but they refuse to meet face to face, and the negotiators led by the Russian Federation and the United States must meet with them separately. Also, some countries’ leadership including the United States believe the current harsh dictatorship led by Bashar Assad must be replaced. Others, including the Russian Federation, believe a replacement could lead to a more militant form of Islam than Assad’s Alawite sect, which could further destabilize the region. “Is there hope for peace?” a student asked. 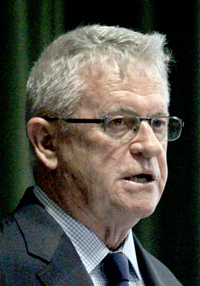 “People do get tired of fighting eventually and stop fighting, but it won’t be soon,” Kennedy said. In the meantime, “the power of prayer is important; keep praying for peace in Syria,” he advised. Katie Innamorato, a senior, plans to focus in college on environmental science, not political science, but “as general knowledge it was very interesting and it was definitely good for me to be here,” she said.